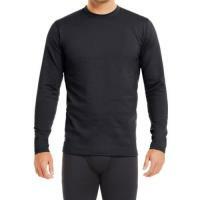 A warm, comfortable and durable base layer is key to defeating frigid temperatures and Under Armour's Men's ColdGear® Infrared Tactical Crew Shirt does just that. The fitted style sits close to the body to create an ideal amount of air space for a base layer shirt without uncomfortable or restrictive compression. UA's signature ColdGear® Infrared technology utilizes a thermo-conductive interior lining to trap body heat while their trademark moisture transport system wicks away chilling sweat, creating a long lasting, thermally balanced environment. Designed for active wear, the sturdy four-way stretch fabrication and smooth flatlock seams offer chafe-free and unrestricted mobility for all-day comfort. Walk through the doors at the end of day feeling fresh thanks to the incorporated anti-odor technology that halts the production of odor-causing microbes.